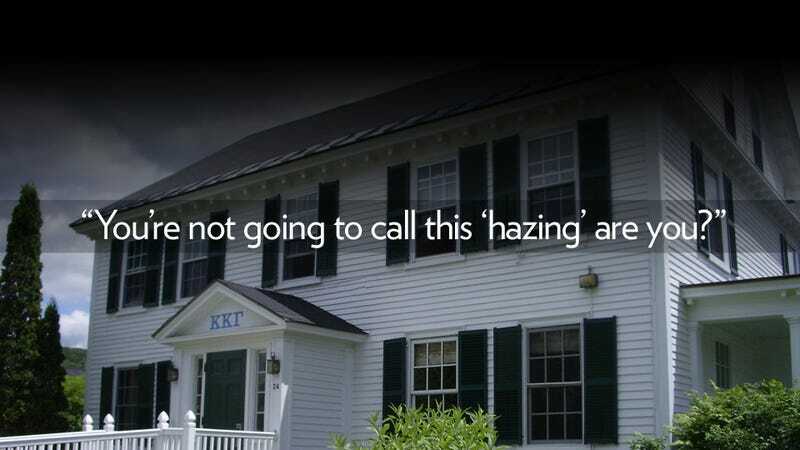 After Andrew Lohse, the former Dartmouth frat boy who revealed some dark secrets about the hazing rituals that are apparently commonplace on campus, there's been a lot of discussion about what exactly goes on in the bowels of fraternity houses. (Kiddie pools full of bodily fluids and eating something called a vomlet, for starters.) But now a female Dartmouth alum has come forward to reveal that the hazing that goes on at sororities there is just as horrible—and she should know, because it almost killed her. While the Rolling Stone article on Lohse covers the abuses of the Greek system as a whole—and it discusses that girls are often sexually assaulted as a result—little mention is made of hazing that goes on in sororities. That's mostly because the article centers on Lohse's claims and their veracity. While a lot of what he says seems to be accurate, he not a particularly reliable or even likeable narrator, and there's been an insane amount of pushback from the schools alumni who refuse to admit that there's a problem while simultaneously suggesting that these practices are a tradition and therefore are sacred. I was blindfolded with two of my fellow pledges. We were guided into the back seat of a car and one of our future sisters commanded us to chug the alcoholic punch that had been pre-prepared for each of us in individual 64-ounce water bottles. Simultaneously, I was handed numerous vodka shots from the older sister sitting in the front seat. Things happened quickly. After what couldn't have been more than a fifteen-minute drive, I was told to get out of the car. I did — but then I lost all consciousness. To this day, I have no idea what happened that night. I woke up the following morning in the Intensive Care Unit at Dartmouth Hitchcock Medical Center. I wasn't alone. I later learned that three other girls had also been admitted, each having overdosed on alcohol due to hazing rituals. Two were fellow pledges, and one was pledging another sorority, Sigma Delta. I had bruises and cuts all over my body, two of my teeth were broken and I was intubated and restrained. The doctor informed me that I had entered the hospital with a .399 blood alcohol content. I soon learned that a .4 BAC is coma and death. I was literally one sip of alcohol away from dying. We sat on my bed, both still in shock. She appealed to me, "You're not going to call this 'hazing' are you?" "Of course not." I reassured her. I took full responsibility. Nobody had forced me to drink. I quickly listed all of the reasons why this was the farthest thing from hazing. In truth, our real fear went unstated: neither of us wanted to point fingers at our sorority and incur the social ostracism that would surely follow. I assured the administration that I had not been hazed. I could almost hear a collective sigh of relief. This was just the bad judgment of one sophomore. There would be no bad PR. My sorority went unpunished. Well, that's maddening—and it's the kind of thing that's bound to give every parent of a Dartmouth sorority girl serious pause when writing that next tuition check. What's interesting is that despite the fact that Segal had what sounds like a tremendously traumatizing experience, she still goes to great lengths to defend the acts of her senior sorority sisters that landed her in the hospital that night. Within the context of Dartmouth's social environment, two intelligent and compassionate women commanded me to drink a lethal amount of alcohol. And within that same environment, I listened. I almost lost my life that day and, infuriatingly, nobody — and everybody — was to blame. The Rolling Stone piece says much the same thing of Lohse's experience. It's disgusting, but it's also easy to see how things ended up this way. Of course, now that they're facing the glare of the national spotlight, it continuing to sweep this under the rug isn't really an option for the school or the fraternities and sororities any more. Segal sees this as an opportunity to start a conversation about changing things for the better. Ideally, this conversation would be led by Dartmouth's president, Jim Yong Kim, whose handling of this situation so far has been mixed at best. But Kim was recently nominated by President Obama to take over the presidency of the World Bank; so he may end up passing the buck onto someone else. Segal, however, makes the valid point that it's also up to the alumni to start being honest about their own hazing experiences, and also to encourage reform for the benefit of current students. After all, just because they didn't die during rush doesn't mean the students of today should have to.